At 6:17 a.m., I watched the big Delta jet land at the Cincinnati/Northern Kentucky Airport. Within minutes, I would see Catherine for the first time in a year. 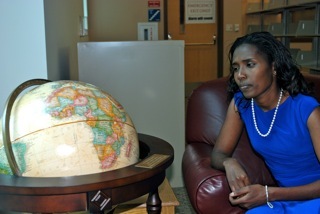 Our Samburu ‘daughter’ has been in Seattle, Washington, working on her Master’s Degree since last summer. On May 13th, 2012, with great pride and admiration, we watched Catherine walk across the platform and receive her B.A. 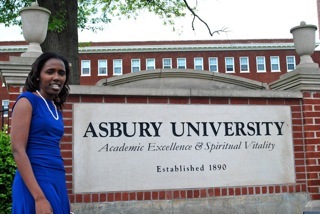 from Asbury University. Her graduation marked a major milestone in her preparation to return to Kenya and work among the women in her tribe. We are fortunate to have Catherine as a part of our New Hope International Ministries family. Catherine is now halfway through her Master’s Degree in Community Development for Third World Countries. This degree will be another step in her preparation here in the States. She can see the light at the end of the tunnel. Catherine is eager to return home to the area in the desert communities of Samburu in Northern Kenya. 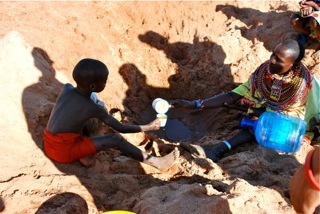 A Samburu woman and her children dig for water in a dry riverbed 7 miles from their home. It seems only yesterday that Catherine was a young girl walking barefoot through the arid bush. She, like most of the other children of her tribe, was on a never-ending search for water and graze for her father’s goats and camels. She never dreamed of anything other than a desperate struggle each day to survive. But the Lord had another plan for her. In the spirit, the Lord spoke to her, “ For I know the plans I have for you,” declares the Lord, “plans to prosper you and not harm you, plans to give you hope and a future.”(Jeremiah 29:11). Catherine is no longer a child physically or spiritually. She is a beautiful young woman who is mature in the Lord and highly trained to work among her people. She longs for the day when she can return home to share “hope and a future”. I am called to be His hands and feet, to represent the God of justice and grace in action and in spoken words among the Samburu people. I am fortunate to be loved by a God who is mighty, and I am overwhelmed by His neverending blessings and provision. He has provided throughout my life, and He does so by putting people in my life, people who are supportive, encouraging, and, more so, people who inspire me in so many ways. One of the gifts He has put in my heart is to love people, to see them the way He does. This desire to love and serve the Samburu community, my people, is God’s gracious gift to me. It comes from no inherent goodness or cleverness of my own. I live only by the grace of the one true, sovereign and merciful God, whom I rejoice to call my Father. I seek to please Him and only Him in all that I do. Please pray for Catherine and for New Hope as we continue with this journey of bringing life – physical and spiritual – to the Samburu people. Prayers and any financial support you may be able to provide can help us help her finish her preparation debt free.